Local Flavor: Victor’s Hummus strikes (creamy) gold. Hummus is a Mediterranean staple and one of the oldest foods that dates back to ancient Egypt. Traditionally, hummus is a creamy blend of garbanzo beans (chick peas), tahini, garlic, olive oil, lemon and sea salt. Consumed as a dip or spread, this exotic and flavorful condiment is rapidly gaining popularity. According to market research, hummus consumption in the United States has increased by 35% over a period of 21 months, with sales reaching nearly $300 million. Victor Azar, local restauranteur and famed caterer may just be on to something. All natural, organic and hand crafted, Azar makes one of the very best hummus selections on the market. For Azar, hummus is a staple as he authentically specializes in Lebanese and Mediterranean cuisine. 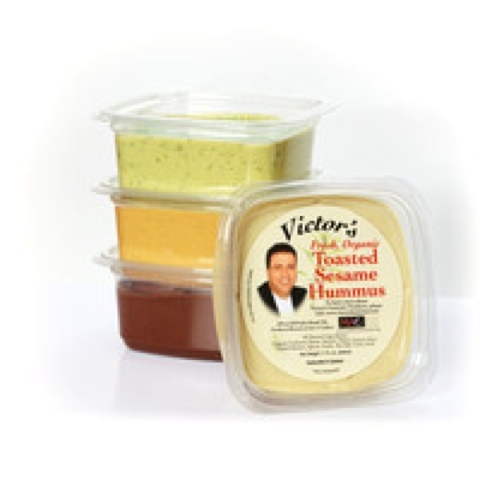 You’ll find Victor’s Hummus to be exotic, flavorful and deliciously habit forming. 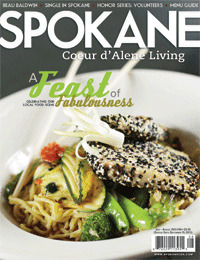 The Azar family has been in business in the Spokane area since 1973. Many retail establishments, including restaurants, have been successfully owned and operated by the Azars. Victor and Viola Azar, a brother/sister team, acquired some coveted cafeteria contracts such as Avista and Triumph (formally Boeing). In 2007 they acquired the contract for Café Mac located inside the Northwest Museum’s Art and Culture. The old brand “Azar’s” became limiting, because it was synonymous with Greek food. This is when the idea for “D’Zaar, Food Fit for Royalty” came about. D’Zaar Food Service & Catering is an exciting venture for this sibling business creating easy access to Victor’s award winning hummus. Thankful fans of the creamy gold known as Victor’s Hummus can purchase the handcrafted hummus at 20 area grocery stores, such as select Rosauers, Huckleberry’s, Super 1 and Albertson’s. It is also available at Café MAC, The Rocket Market, Alpine Bakery and The Sapphire Lounge at Hotel Ruby. Although the traditional hummus is always in demand, Azar has creativily added some new varieties. Discover his entire line up: Chocolate H’ mousse, Jalapeño, Basil, Lemon and Toasted Sesame. With so many varieties to tantalize our taste buds and a commitment to fresh and organic, it’s not surprising its becoming a staple for area residents as well. Local wine pairing: Latah Creek Wine Cellars' Pinot Gris is practically perfect with warm pita bread and Victor's creamy hummus.